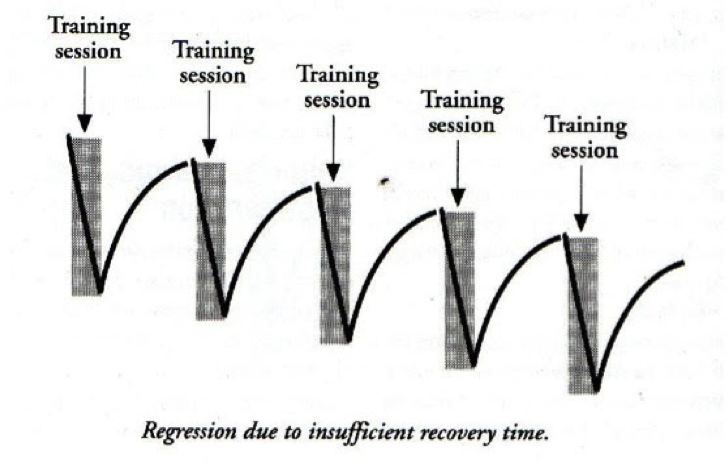 You get weaker during workouts; you get stronger during recovery & rest. What we mean by this is that excessive, challenging workouts all the time can leave you too weak, actually decreasing instead of increasing your performance. Having good progression in your performance starts from having an understanding of what exactly training sessions do to your body. We have a handful of simple diagrams below to illustrate these processes. At regular levels of activity, the body is in a state of equilibrium. It does not get stronger or weaker as long as this state is maintained. During a training session, the body undergoes various kinds of stress, or stimuli that are catabolic (involves the breaking down of cell tissues). At the end of the session, it is left in a weaker state than it was at the start. The harder the workout, the weaker the state the body will end up in. 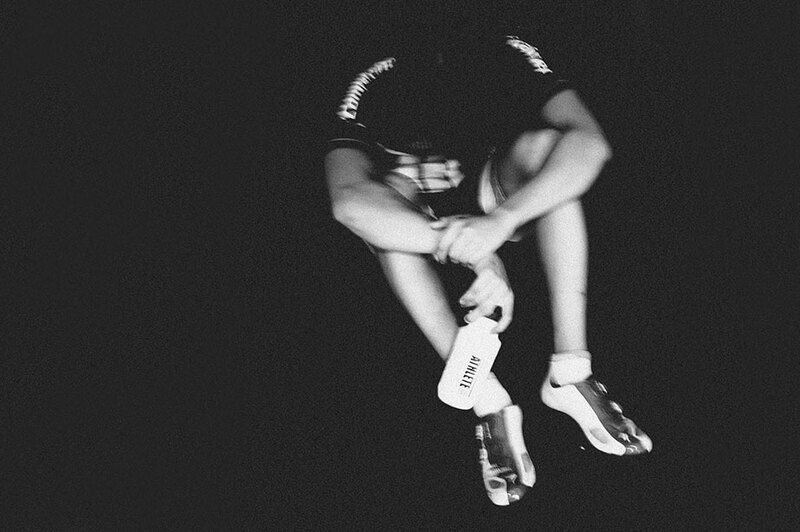 That is why you never see us asking you to smash out, say, an FTP test (the most demanding thing we can offer where you aim to do your best at your own volition) straight after a hard workout. There would simply be no way you would get your best numbers! 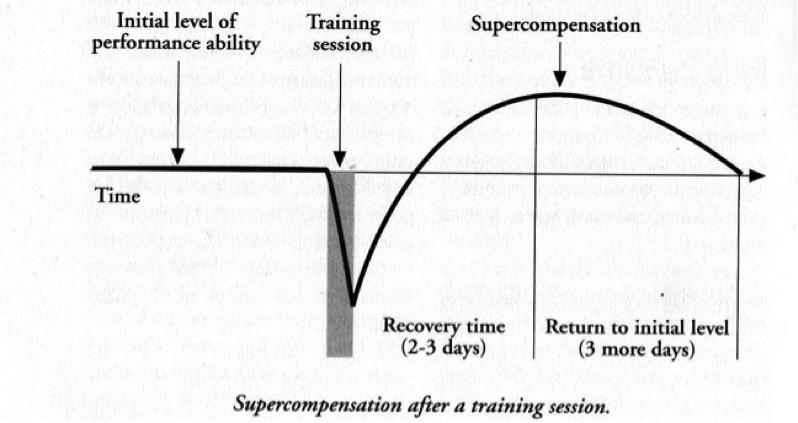 When the body is left to recover, it will adapt and learn to be better prepared the next time such stimuli appears. This is called supercompensation, comprising of anabolic (growth, regeneration, and repair) processes, where the body settles into a more developed state than its previous ‘untrained state’. If no further stimulating activity occurs, the body goes back into its original state after a few days. Essentially, your performance progression or regression hinge on the balance of catabolic and anabolic processes you subject your body to. 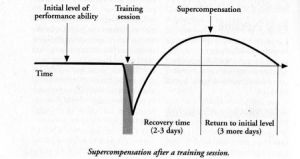 If, on the other hand, we play it smart and go easier on ourselves by creating a more ample buffer space of time, we allow super-compensation to occur, before hitting another hard workout – and then repeat, letting our super-compensation stack upon itself (see the last diagram at bottom). 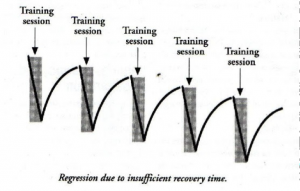 Recovery in that sense can take on many forms, the most well-known of which is the active recovery. Characterised by light intensities of a familiar exercise, it allows for continued cardiovascular circulation, mobility, and muscle function… but without the stress of a full-on workout, thus still allowing super-compensation. A variation of this involves cross-training with a different exercise (eg: a cyclist who wants an active recovery might choose to go for a walk or a swim). 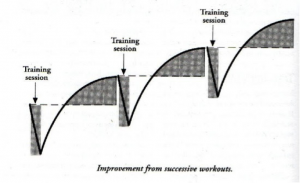 By alternating hard and easy training days, we create a routine that still produces a progressive performance scale. Or… just veg out. No, seriously, we mean that total rest is sometimes best! Giving yourself an extra treat – a sports massage, an ice bath, spa treatment, back rub from a significant other, or stretch/yoga/meditation session – can pay off sometimes, but the key to optimal supercompensation is letting your body reap the benefits of basic, day-to-day, natural functions (being fed and hydrated well, having quality sleep, being placed in a non-stressful environment). Progress also occurs at rest, even though you feel you may be wasting your time by ‘doing nothing’. In conclusion, the motivated athlete should know how to train hard – having all the tools at his/her disposal; but they must also know that to see the results of hard work, said athlete’s body must be allowed to get stronger on its own terms with subsequent smart rest/recovery.